Exclusive Premiere: The Everafter Offers Their “Perspectives” – Ouch That Hertz! The American author Allen Klein once famously said, “A little perspective, like a little humor, goes a long way.” What he alludes to is the concepts of having a more grounded worldview. As conscious, self-centered beings, our experience in life is inherently a subjective one; too often are we steeped so far into our own mindset that we become internally concave to the world, lashing outward as we paradoxically recoil inward. Thus, we require active measures towards a more conscious and collective existence, bearing unity in mind as we attempt to establish a point of view that is as all-encompassing as we can humanely attain. Simply a touch of an outward stance does, as Klein stated, go a long way in the name of interdependence and stable connectivity in a progressive world. Such is the plight discussed in New York-based pop-punk outfit The Everafter’s brand new single. Aptly titled “Perspectives,” the quartet wields their dynamic musicality against what they view as the feedback loop of egocentrism with which some may cling to despite all societal bereavement and social displacement. To this displacement of progressive core values, vocalist Cora Small assigns blame to the reverence of unappreciative, unsatisfactory, and unnervingly unfeeling role models. Henceforth, the band offers us their “Perspectives-” a commentary on social collapse founded on negativity, backed masterfully by their signature use of honeyed harmonics and driven instrumentation. “Perspectives” is a surprising effort on The Everafter’s part, pinning a hardened, could-be riotous sound to unapologetically steadfast edge. The result is a savory manifesto, a call-out and a reestablishment based on punchy vamps and driven verse, all still packaged tightly and brightly with flourishes of sensible melodies. “When writing ‘Perspectives,’ I thought about these so-called “role models.” I didn’t think these people were worth losing my cool over, but it got under my skin, so I wrote. The distaste I had for the sheer lack of common courtesy poured onto my notebook. I often wonder why the majority of the population supports this bad behavior. I don’t want the younger generations to get the impression that you only do well in life if you are a mean-spirited person. At the end of the song, I sing, “I want to make my mothers’ proud-” by this, I don’t mean a literal mother, but rather all the strong women that came before me. I’m referring to women such as Susan B. Anthony, Margaret Sanger, Ida B. Wells, Katherine Hepburn, and so on. With fame comes influence; we lead by example… and the greater number of people are putting ill-mannered individuals at the top of a pedestal along with their influence. That’s a scary thing. This is what ‘Perspectives’ is all about. Toe-tapping, air-punching, The Everafter’s “Perspectives” is not something to be taken lightly. Today, we have the pleasure of presenting to you an exclusive window into The Everafter’s “Perspectives.” Enjoy! 8/14 – Johnson City, NY – Avenue D.I.Y. 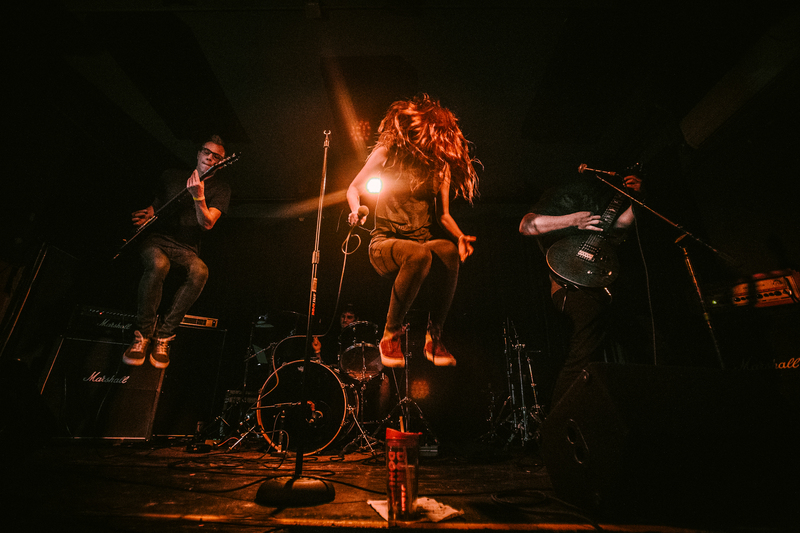 Pop-Punk outfit, The Everafter are a Yonkers-based quartet comprised of vocalist Cora Small, rhythm guitarist Rich Rivera, lead guitarist Ryan Lare, and drummer Danny Nugent. Meeting in college, the four members found instant musical and personal chemistry. After 10 assiduous months of writing and collaboration, The Everafter burst onto the scene with their single/video debut of “Call it a Night,” which features powerful intros, high-energy verses, and catchy, emotional choruses, sure to hook the ear of any listener. Determined to build and maintain momentum, the band has already premiered their debut EP Whatever’s Bringing you Down on February 23, 2018. The band has also found equal success in their live performance and touring record. They’ve departed on two small toe-tapping runs around the East Coast in the Spring, and leave for a twelve-day tour on Friday, August 10th. With all of this achieved in just one year, the future seems bright for the young budding sensation that is The Everafter.